Public parking downtown is free, with time limits. In general, the closer you are to your destination, the shorter your time limit will be. On-street parking is two hour, surface lots are two and ten hour, and downtown's two parking decks are three and ten hour. There are also a few 30 minute spaces found at the ends of parking rows for your quick, in-and-out errands. In addition, Harrisonburg Downtown Parking Services provides free parking in the Municipal Parking Lot up to 24 hours. All parking spaces have designated signs that state the time limit. Parking downtown is enforced on the 7-7-6 Plan: 7am to 7pm, 6-days per week. Enjoy evenings, Sundays and holidays without restrictions. One exception to free parking is the upper levels of both parking decks, which are available to lease for downtown employees and residents. For rates and other information on leased parking, please contact Downtown Parking Services at 540-432-8928. *2019 Parking Permits for both Water Street and Elizabeth street decks are now available. Permits are available for pick up in parking services in the lower level of City Hall. 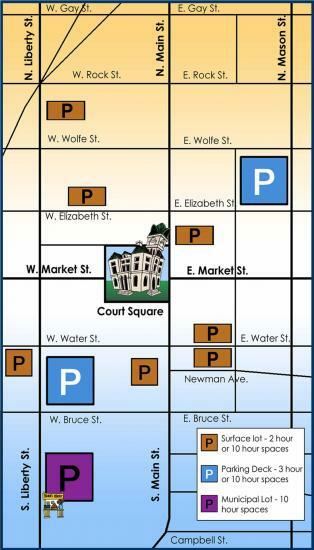 City owned parking and street parking downtown is regulated Monday through Saturday 7:00am to 7:00pm. The fine for overtime parking is $20. Do You Have a Parking Lot/Deck Maintenance Concern? Public Works assists with the maintenance, regular cleaning of and trash removal from the two parking decks, as well as nine parking lots. Maintenance also includes daily cleaning, lighting, snow removal, landscaping and signs, etc. You can report missing or graffiti tagged parking signs to Don Musselman at Donald.Musselman@harrisonburgva.gov or by calling 540-434-5928. 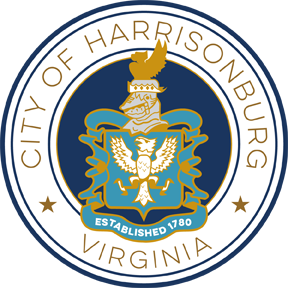 The Downtown Parking Advisory Committee monitors the policies regulating all on-street and off-street parking that is owned and operated by the City of Harrisonburg.